To get your brand message across to your audiences, it’s key to know where they are hanging out. With users now spending an average of 20 minutes per day on social media, most of the audiences audiences of hi-tech companies are hanging out on either Facebook, Instagram, LInkedIn, Youtube or another social media platform. Before we can get onto social media, it’s pertinent to craft a message about our brand and about our products or services. 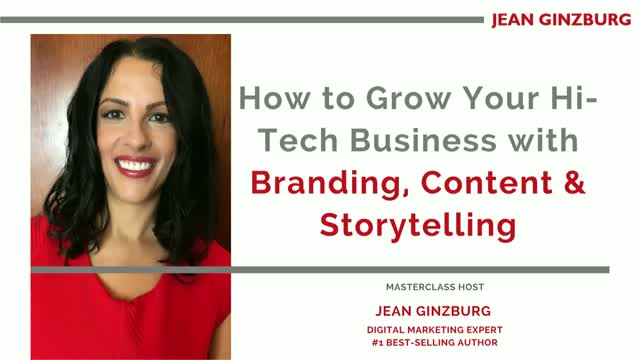 Join this live webinar with Jean Ginzburg, Digital Marketing Expert and #1 Best-Selling Author, as she covers how best to extract the message from your own business and how best to create it for your target audience. Once we have crafted our message, we will cover on how best to create content, what types of content works best now and the components of a well-crafted content piece. And now we are ready to distribute our messaging and content across social media. We will also cover specific examples of branding, messaging, content and social media from the hi-tech and SaaS industries.